Storm Ali caused chaos across Ireland and claimed two lives with its destructive power magnified by the lingering damage of storms Ophelia and Emma. 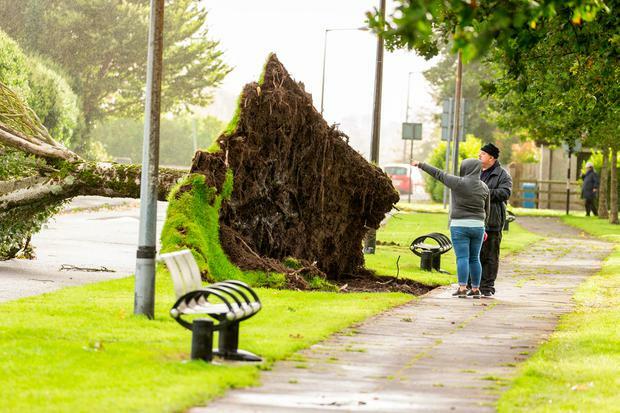 It brought down trees, damaged houses and sparked transport paralysis as it swept across Ireland with gusts of up to 150kmh. 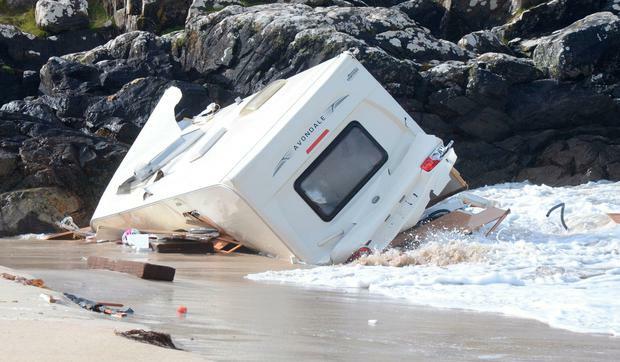 A woman, a Swiss tourist in her 50s, died in Clifden, Co Galway, when the caravan she was sleeping in was blown over a cliff. In Co Down, one man died and another was injured after a tree fell at the entrance to Slieve Gullion Park. 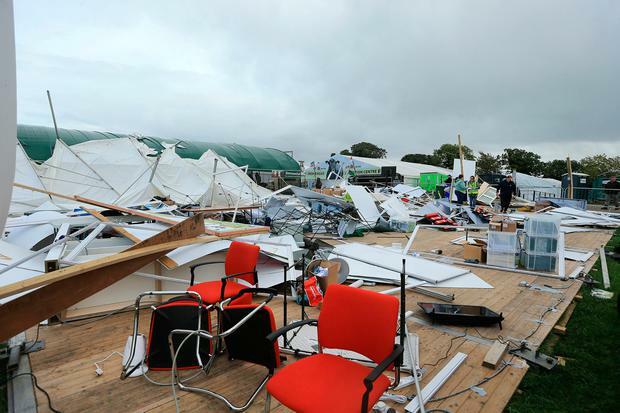 The Ploughing Championships outside Tullamore, Co Offaly, was hit with the organisers forced to cancel its second day over safety concerns. Forecasters had issued a Status Orange wind warning for more than half the country due to the storm. All across Ireland, hundreds of trees - many weakened by storms Ophelia and Emma - toppled in the gusts, causing chaos for the electricity supply network. Dozens of roads were blocked and power lines brought down from Kerry to Galway, and Cork to Dublin. At the peak of Storm Ali, almost 190,000 people were without electricity as the ESB battled to deal with 750 different line faults, many in remote areas. "The damage is mainly attributable to fallen trees on overhead lines as a result of the high winds," an ESB spokesperson said. The worst hit areas were Galway, Roscommon, Mayo, Cavan, Laois, Clare, Kerry, Tipperary, Cork, Sligo and Louth. ESB repair crews of more than 2,000 personnel were on standby, but they were only able to begin reconnecting suppliers when wind gusts had eased. By last night power had been restored to 119,000 customers, but the ESB warned it could be several days before all customers are reconnected. Adding further to the infrastructure headache was damage to mobile phone and telecommunications masts. 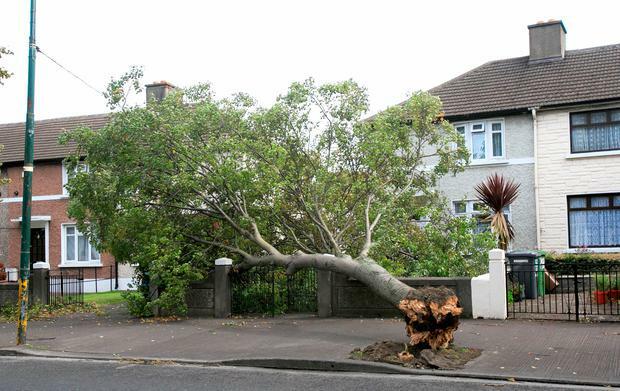 A large tree was brought down in Crumlin. Eir, one of Ireland's biggest telecommunications providers, confirmed that more than 80 of its mast sites had lost electrical supplies. Other mobile phone operators said masts had been damaged by the high winds. In Dublin, several parks closed amid public safety fears posed by falling trees and flying debris. A number of iconic lime trees on Cork's Centre Park Road - planted to mark the opening of Henry Ford's plant more than a century ago - toppled yesterday, with Cork City Council closing the road amid safety concerns. Last October, 35 trees toppled along the historic route at the height of Storm Ophelia. Fortunately, property damage was minimal, though some homeowners had very lucky escapes. 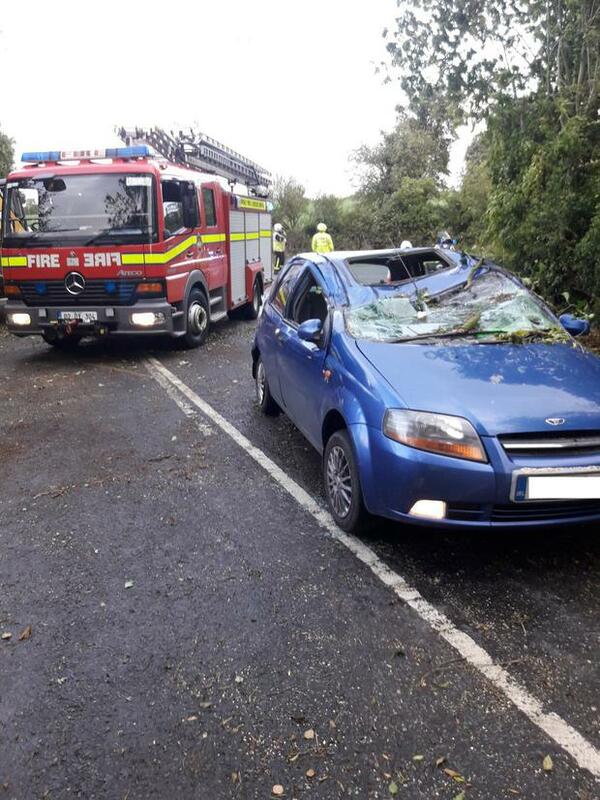 One Offaly motorist suffered minor injuries when a tree fell in front of his car. 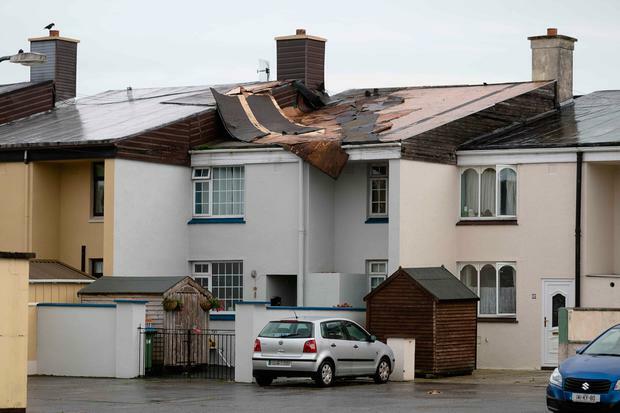 In Blarney, Co Cork, the felt roof was ripped off Sabrina Lehane's family home and landed in the garden of another house. In Galway, neighbours successfully used a JCB's hydraulic arm to help support a roof which had threatened to be ripped off a building at the height of the storm. Across multiple counties, dozens of roads had to be closed by council and Garda units due to the risk of fallen trees. "Road conditions are dangerous across the country," AA Roadwatch said as the storm hit yesterday morning. An Post said its services were disrupted with 60 post offices affected at the height of the storm. 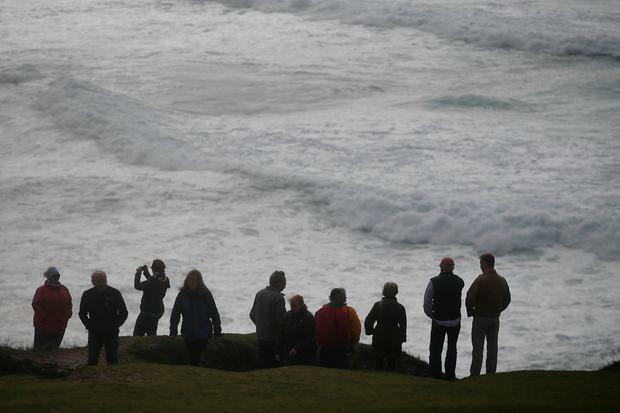 Such was the danger posed by the violent wind gusts that the Cliffs of Moher Centre was closed yesterday. Other tourist attractions such as Skellig Michael and the Battle of the Boyne Centre were also closed. The powerful winds caused travel misery for commuters nationwide. In Galway - which suffered the worst of the Storm Ali winds - Bus Éireann at one point suspended all city bus services amid public safety concerns. In Northern Ireland, the M1 motorway was closed in both directions just west of Belfast due to fallen cables. More than 70 flights were cancelled at Dublin Airport because of wind gusts. Another 10 flights were diverted to other airports not affected by the storm. But with Storm Ali tracking over northern England and Scotland from Ireland, there was day-long disruption for many UK-bound flights. Similar disruption was caused at Shannon and Cork airports. Mainline rail services also had to be suspended in parts of Louth and Roscommon at the height of the storm. Ferry services in the Irish Sea were temporarily suspended due to adverse weather conditions. Iarnród Éireann suspended a number of rail services including one section of the Dart in Dublin. Luas services were also hit when a tree fell on overhead power lines between Ranelagh and Beechwood. Last night operator Transdev said there will be no service this morning between Beechwood and Dawson Street as significant repair works need to be carried out. The situation will be reviewed at 12.30pm.